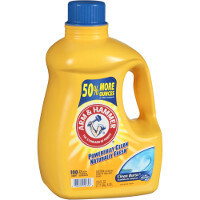 Arm & Hammer Liquid Laundry Detergent sets the standard for purity. It leaves clothes powerfully clean and naturally fresh. Its special formula contains no phosphate and is safe to use with septic systems.